﻿﻿﻿﻿Prism Book Alliance: Paisley give 4 stars! There is a lot to like about this little book. For starters, even though it’s a novella it packs a pretty good fist of drama. Read the review. Molly Lolly: Molly gives 4.5 stars and says: Elizabeth did a fabulous job laying the pieces, but not too many. I liked watching Wyatt and Val’s relationship build slowly. They were suited for each other very well.Read the review. Inked Rainbow Reads: Sarah gives 4 stars and says: This is an exciting, whirlwind tour of the horseracing industry. The author has researched the racing world carefully for this suspenseful murder-mystery story. Her Kentucky farmland is an eerily idylic setting for the gruesome goings on. Val’s isolated cottage is way too spooky late at night! Read the review. Boys in Our Books: Sheri's review: Horses and racing will eventually take you to Kentucky, which is where we head for this mystery. Follow the big hats, big horses and bigger trail of cash to the track. Read the Review. Icon and cover art by TL Bland. Please feel free to copy icon for your use. Hearts on Fire Reviews: Wendy awards 4.5 stars and says: This book had some sugar and spice, a hint of naughty, but lots of nice – it was like a comfort read with a kick! Read the review. Love Bytes Reviews: Donna gives 4 stars and one of the most creative recommendations ever: this book comes with an Endorsed by Donna sticker slapped on its rump. It truly is worth reading. Read the review. Rainbow Book Reviews: ﻿Christy Duke gives four stars and says: This was an exciting story with a great plot. The intrigue and mystery was fun, and, even though I guessed the outcome, I still enjoyed it very much. A good beginning for a new series.﻿ Read the review. Crystal's Many Reviewers: Crystal Marie gives five stars and says: Even adding in the insane amount of drama and suspense that was taking place in this book, I just couldn’t put it down. Read the review. 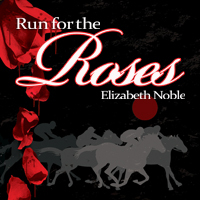 On Top Down Under Book Reviews: Kazza's review: I was on a mission to find a book that was light, easy, and uncomplicated reading when I bought Run for the Roses. I had read one other book by the author and it was a good read so I dove on in. This book met all my criteria nicely and I really enjoyed the journey with Val, Wyatt and Janelle the jockey. Read the review. Alpha Book Club: Mollien give 4 stars and says: Val and Wyatt have an interesting chemistry that works in this story. The pacing is fast and exciting. There is an exciting ending to this book and it does continue with a new story in A Barlow Lens, book 2 in the circle series. Read the review.